If you’re new to strategy card games, you may find yourself with a lot of questions as you assemble your first deck. How many cards should be in your deck? How should you balance out your magicka costs? What’s the right amount of variety to have in a deck? The rich story campaign in The Elder Scrolls: Legends is designed to help you answer some of those questions, but we have some additional tips and info to help you get started. 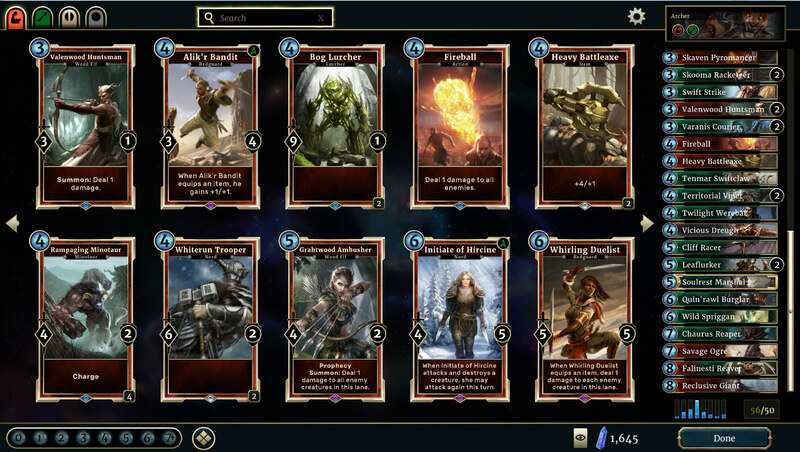 The minimum (and recommended) deck size in The Elder Scrolls: Legends is 50 cards. Traditionally in card games you want to keep your deck as close to the minimum as possible. When you keep your deck to the minimum size, you increase your odds of drawing the best cards in your deck at the times you might need them most. Can you make your deck larger than 50 cards? Certainly! You can have up to 70 cards in your deck. But competitively speaking, 50 cards is a pretty good point to aim for. Each deck in Legends can contain one or two of the five attributes , but no more. There are benefits to either configuration. Going with one attribute ensures that cards like Baron of Tear are more likely to trigger their Summon. On the other hand, having a deck that contains two attributes gives your deck more versatility, along with the ability to play dual-attribute cards. Both choices have their pros and cons and are largely dependent on your own unique play style. Keep in mind that neutral cards (cards without an attribute) can be played in any deck, regardless of the number of attributes the deck contains. You can include up to three copies of any card in your deck. When you have multiple copies of a card, you are obviously more likely to draw it in any given game. There are, of course, situations where you might not want to have three of a certain card. This often comes into play when looking at cards that cost six or more magicka. You don’t want to clog up your hand with cards you’re unable to cast in the early game. Having fewer of these allows you to prevent this. Unique cards are some of the most powerful in the game. 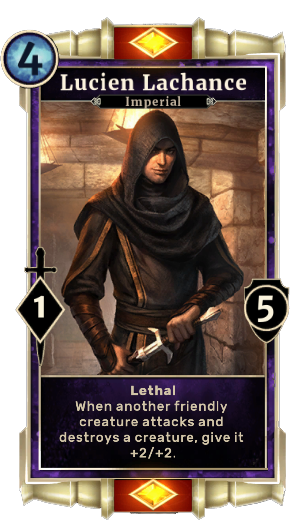 They also happen to be unique in terms of Elder Scrolls lore; after all, it doesn’t really make sense for you to have three Lucien Lachances in your deck! You can only put one copy of these cards into your deck, and they must still fit into your deck’s chosen attributes. Your magicka curve is something you want to be mindful of while building your deck. You typically want a low number of zero and one costed cards; a good deal of two, three, four, and five costed cards; and a low number of six or higher costed cards. This would result in what should look like a bell curve for your deck. Most of the action in a game tends to take place between two and five magicka. As we mentioned, you don’t want your early hands bogged down with cards you can’t cast until the late game. Similarly, you don’t want your late game draws to be underpowered zero- or one-cost cards. Typically, having a high concentration of two- through five-cost cards is a safe call. This isn’t always the case. Sometimes you’re going to be playing a more aggressive deck that’s extremely heavy on the one- and two-cost cards and eschews anything above four or five magicka altogether. This is just the tip of the iceberg when it comes to building your deck in The Elder Scrolls: Legends. You’ll be introduced to more basic deck building strategies through the campaign, and we will continue our Legends series with more advanced tips in the coming weeks.